A speciality Eye hospital with latest machinery and equipments (approx. cost 3 crore rupees) is proposed in first 3 floors of the building. Card holder can avail discount and do charity by helping others who cannot afford to do their operations or Eye check up. For example, a kundan card holder can every year recommend 2 cataract operations. 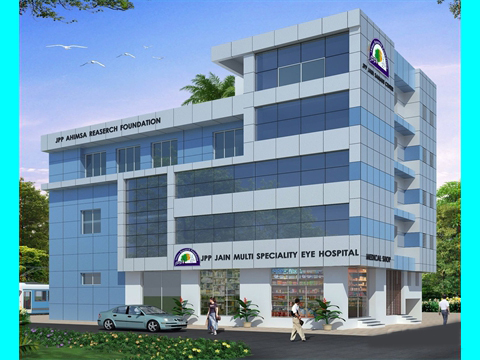 The aim of this eye hospital is to conduct 100 free eye operations every month. A place for S.S. Jain samani group to stay, gain education and propagate Jainism and non-violence. A well furnished J.P.P. Jain Guest House will come up in the third floor of building to provide rooms to card holders. A J.P.P. Jain Bhojanshala will also be there to provide pure veg., healthy, jain food to card holders & Hostel students. Providing free food to the needy persons every fortnight. Boarding and lodging facilities for jain students studying in Bangalore.